In May 2006, Eurocopter France was permited to fly the 2006-built Eurocopter EC155 B1 s/n 6739 with test-registration F-WWOV. 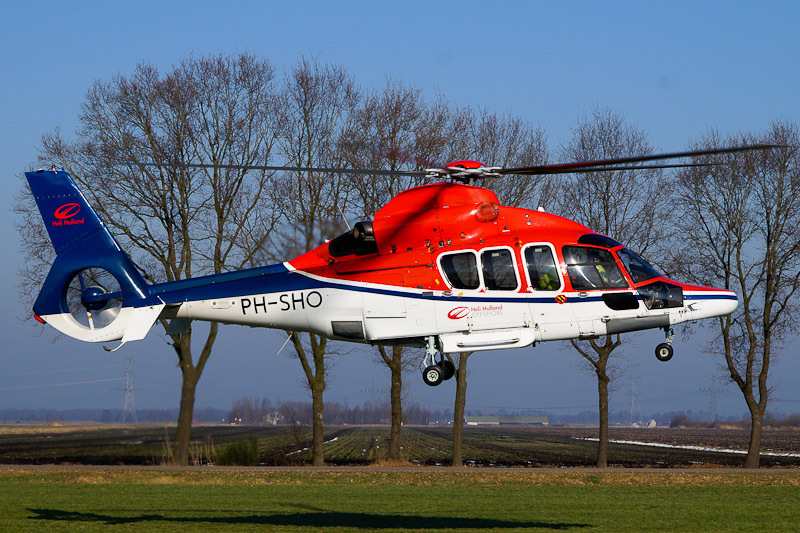 On 11 July 2006, the aircraft was registered PH-SHO in the Netherlands with Capital Aviation Services BV, Hoofddorp, as owner and CHC Helicopters Netherlands BV, Den Helder, as registered operator. On 16 June 2011, the registered ownership changed to Lombard Corporate Finance (12) Ltd., London, UK, and a few years later to Lombard North Central PLC, Redhill, UK. As before, the Dauphin II was operated by CHC Helicopters Netherlands BV, Den Helder. In November 2016, the helicopter was sold to Heli Holland and on 2 November 2016 flown from Den Helder to the Heli Holland heliport near Emmen. On 14 February 2017, the Heli Holland Offshore EC155 B1 PH-SHO was seen at the Heli Holland heliport.